If you are new to the VPN game, you might notice that there is a lot of mention of the term “5 Eyes”. Of course, you could be hearing about the more inclusive lists that include “9 Eyes” and “14 Eyes” as well. However, you probably have no idea what those words mean. To put it very simply, these represent the most powerful surveillance alliances in the world. These intelligence alliances comprise of the agencies from various countries from around the world. 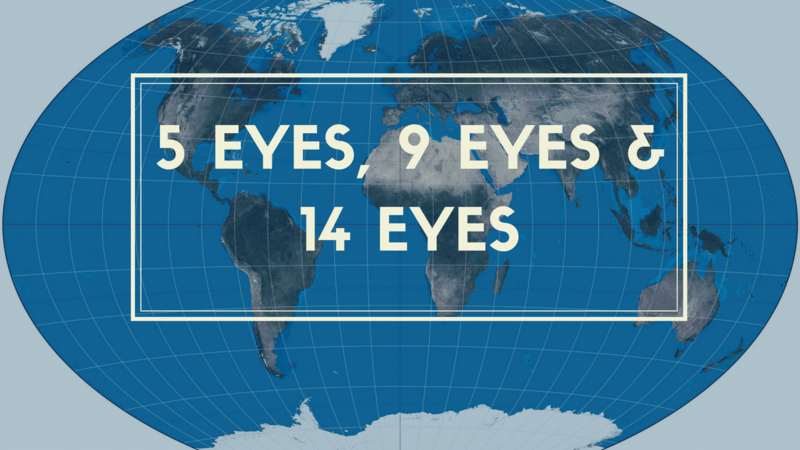 The first one to appear was the Five Eyes – comprised of the United States, Canada, the United Kingdom, Australia, and New Zealand. If you want a great VPN service outside the 5 eyes, 9 eyes and 14 eyes countries, then NordVPN is the service we recommend. These intelligence alliances are pulling their efforts together in collecting incredible amounts of surveillance data. They share that data amongst each other, essentially creating a global intelligence entity. That entity is now there to collect data from everyone online, including everyone reading this article. Understandably, you might want to protect yourself from their spying efforts. If that is the case, using a VPN service might help. But, you should really understand how these alliances work. Believe it or not, the Five Eyes alliance has roots that go back to the World War II. During the war, the intelligence agencies of the United States and the United Kingdom were sharing their intel with each other. However, once the war was over, they didn’t stop co*operating. So, they chose to make an agreement to put it all on paper. The UKUSA agreement of 1946 is possibly the most important date in the history of FVEY. A very short period of 9 years later, they updated the agreement to include New Zealand, Australia, and Canada as collaborating countries. Now, as you know that these alliances are spying on your everyday computer use, you might think that they consist of relatively low-level agencies. However, you would be wrong to believe that. Namely, the FVEY alliance consists of all of the “largest” government agencies in the world. The FVEY alliance’s system separates different types of intelligence into four different categories. Human intelligence, for examples, encompasses the collaborating work of agencies such as CIA, MI6, SIS, ASIS, and CSIS. As you can see, these are not “small agencies” by any stretch of the imagination. This alliance is also notorious for creating the ECHELON surveillance system during the Cold War. The main reason the ECHELON system is disliked by the public is not due to that they monitored the communications of the Eastern Bloc. Instead, the main reason lies in the fact that the agencies are using the ECHELON system to spy on private channels of communication worldwide. And, while people started demanding that these invasions of privacy stop, the FVEY kept going strong. In fact, The War on Terror then gave the FVEY even more surveillance capabilities starting with 2001. A noticeable part of that expansion lies in the fact that they put a lot of emphasis on surveilling the Internet. But, it wasn’t until 2013 that we finally understood exactly how detailed and illegal their efforts are. Whether you like him or not, you can’t deny that Edward Snowden gave us an important insight into how these alliances work. They have no regards for their own laws and they spy on their own citizens. They bypass any legislation by spying on the citizens of other members of the alliance instead of their own. But, they still share all of the data. In fact, taking a look at the regulations in some of the countries that are a part of the FVEY alliance, we can see that they are more than willing to abuse and invade the online privacy of their own people. * The Government of the United States is working as hard as ever to set up mass surveillance systems. In fact, they are collaborating with the largest providers of telecom and internet services in the country. Edward Snowden’s leak gave us a lot of information regarding the companies that are working with the government. The PRISM program included Microsoft in 2007, Yahoo! in 2008, Facebook and Google in 2009, Youtube a year later. Lastly, even Apple started collaborating with the US government in 2012. * In the UK, the situation is different, but not necessarily better. In 2016, they passed the Investigatory Powers Act. According to that act, the providers of internet and telephone services have to record browsing histories, text messages, and even connection times of all of their customers. They store this data for two years, and government agencies have free access to the data. The worst part is that they don’t even require a warrant to spy on you. The Nine-Eyes alliance is essentially just an expansion of the FVEY strategy. The alliance includes the original five countries as well as new additions of four second-tier members. These members are the Netherlands, Norway, Denmark, and France. These countries are very active in the alliance, however, not quite to the same degree. Their intel sharing is nowhere near as tight as the FVEY-group’s. The original Five Eyes program dubbed these nations “3rd parties”. While the Nine Eyes parties don’t share the same amount of intel, they are involved in the process of discovering and sharing intelligence to a degree. Take for example Denmark. They allowed the National Security Agency of the United States of America to set up their monitoring equipment on the fiber-optic cables that are entering and leaving Denmark. That deal, on the other hand, gives the Danish intelligence access to the technology and systems of the NSA. That way, they can use advanced monitoring systems for a “relatively low” price of sacrificing the privacy of their citizens. The Fourteen Eyes category is, very simply put, just an expansion of the Nine Eyes alliance. Namely, it includes countries that are not as close to the NSA as Denmark or France for example. These countries are Germany, Spain, Belgium, Italy, and Sweden. The five countries were included in the alliance as a secret. However, the Edward Snowden files allowed us to see that the Five Eyes are indeed working with them. There is, in fact, a separate working agreement amongst all of these countries. The agreement is called SIGINT Seniors Europe. Surprisingly, Sweden had signed the agreement much earlier than many could believe. Namely, back in 1954, Stockholm signed a secret agreement with the Five Eyes. The agreement had Norway tasked with passing data about the Soviet Union to the FVEY countries. And, the recent documents show that the FRA (Swedish intelligence agency) has been very effective at espionage. But, before you relax, you should remember that these alliances are top-secret. With that in mind, there is no telling which other countries cooperate with the Five Eyes. For example, the Snowden leaks have proven that Singapore and South Korea work with the FVEY to a great extent. Other countries many believe cooperate with the FVEY are Japan and Israel. What does all of this have to do with VPN services? Privacy experts advise against using VPN services that come from one of these countries. And, that goes double for providers from the United States. While your data should be safe for a while, if the US government contacts your VPN provider demanding their data, they will get it. Another troubling demand they can make is one that forbids the VPN provider to contact you. So, you won’t even know they have your data. However, simply choosing a provider that is not from one of these countries might not be enough. To further improve the privacy of your data, you should consider several other factors. One of them is the matter of usage logs. Namely, not all VPN providers keep usage logs, and those who don’t, are much safer as a choice. In fact, this is more important than the country of origin. Even if your provider comes from one of these countries, as long as they don’t keep usage logs, you are golden. There simply isn’t anything they can hand over to the government. Ideally, you want to combine the two benefits. If you really don’t want government employees reading through every single email, private message, or a snap you send, you would do well to protect yourself. Find a VPN that is based from outside these countries, and that doesn’t keep logs of the activity history of their users. We recommend NordVPN for this very reason. They are based in Panama and keep no logs.